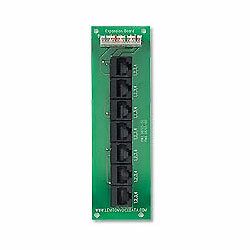 Provides a 110 type IDC connector that brings telephone service in from the demarcation point, distributing the line to seven RJ-45 ports. Route telephone service to remote locations, or link the board to additional modules, such as Leviton's Category 5e Voice & Data Board or Telephone Line Distribution Board. Suitable for phone, fax or modem.